Building a European data economy is part of the Digital Single Market strategy. Last January the European Commission adopted a Communication on "Building a European Data Economy" last January 2017 and launched a public consultation. In response to this Communication BDVA has delivered a position paper a part of the work carried out by BDVA Task Force 5 (Policy and Societal) in collaboration with BDVA Task Force 6 (Technical priorities), and in particular with TF6-SG6 (Standardisation) and contributions from the whole BDVA Community. 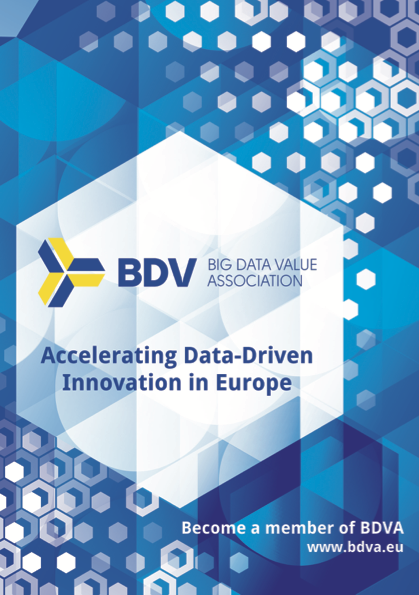 Read more about BDVA Position to EC Communication "Building a European Data Economy"
Join this BDE Webinar about the Common Vision shared by BigDataEurope and the Big Data Value Association. The Webinar will uncover unique insights with regard to maximising Big Data Value and boosting big data innovation in Europe. The agenda includes an introduction to the European Commission’s Perspective, a showcase of the BDVA mission and technical priorities, an elaboration of the BDE actions and technical contributions, and announcements of upcoming activities and synergies. Online public consultation on "Building the European Data Economy" Deadline April 26! Last days to reply to the online public consultation on "Building the European Data Economy" launched by the European Commission on January. Deadline: April 26. Make your voice heard in digital data topics of high relevance to the European economy, digital transformation, economic growth, competitiveness, and society as a whole. Read more about Online public consultation on "Building the European Data Economy" Deadline April 26! The Digital Day, the digital part of the official celebrations marking the 60th anniversary of the Treaties of Rome. takes place on Thursday, 23 March 2017 in Rome. The Digital Day will explore the exponentially increasing role of what digital means for Europeans. The event will reinforce cooperation between public and private stakeholders in the field to improve the daily lives of Europeans and strengthen our economy. It will focus on how the European Union can make the most of digital innovations across society and the economy. BigDataOcean aims to capitalise on existing modern technological breakthroughs in the areas of the big data driven economy, and roll out a completely new value chain of interrelated data streams coming from diverse sectors and languages and residing on cross technology innovations being delivered in different formats (as well in different states, e.g. structured/unstructured, real-time/batches) in order to revolutionise the way maritime-related industries work, showcasing a huge and realistic economic, societal and environmental impact that is being achieved by introducing an economy of knowledge into a traditional sector which does not operate in an orchestrated manner and is rather fragmented. This infrastructure will be combined with four strong pilots that will bring into BigDataOcean a huge amount of data (in TBs) in order to develop the largest maritime database as a resource of collaborative, datadriven intelligence. Watch our video from the BDVA summit 2016, Big Data driving business, and listen to what European industrial data leaders and policy makers think about the European data-driven economy and how big data is transforming industry. A complete path along all the activities developed in the Summit is shown, including the internal General Assembly, the Board of Directors election, the plenary and parallel sessions, the i-Spaces award ceremony, the social events, ... BDVA summit provided a nice environment to network and learn about BDV PPP and the following collaboration opportunities. Data users (Health, Manufacturing, Geospatial, Finance, Telco, ...) were highly involved in the event. You can be prepared for the next Summit to be held in Paris Versailles in Nov 2017. Follow us in twitter to stay posted. The BigDataEurope project announces the second release of the free-to-use and open source BigDataEurope Integrator Platform (BDI). The platform is developed with the aim to facilitate and simplify the use of big data technologies by providing easy-to-use interfaces and deployment options. In this framework, the project offers practical solutions for big data related challenges, as identified and elicited in the context of the seven Societal Challenges, which constitute the project's Big Data focus areas. The Big Data Value Strategic Research Innovation Agenda (SRIA) defines the overall goals, main priorities, both technical and non-technical, and a research and innovation road-map for the European contractual Public Private Partnership (cPPP) on Big Data Value. The SRIA explains the strategic importance of Big Data, describes the Data Value Chain and sets out the general objective broken down into competitiveness, innovation and technology, societal and operational specific objectives.